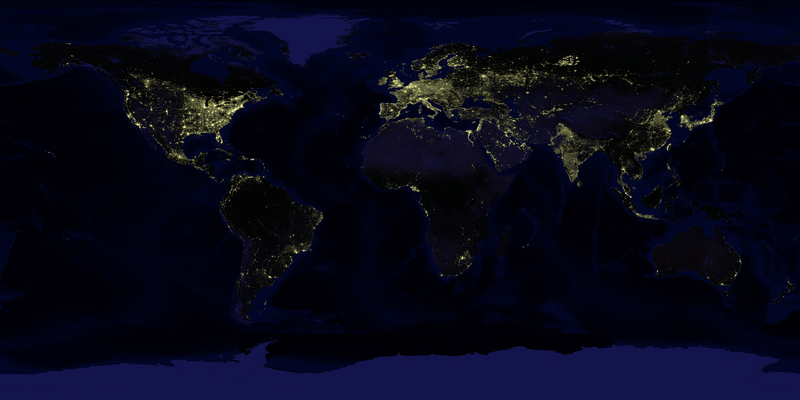 Since the satellite Suomi NPP was launched in 2011, its VIIRS sensors have been providing night-lights data at a resolution of about four pixels per km². 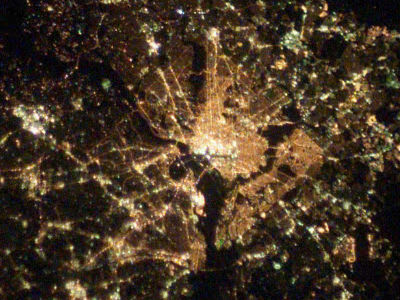 While individual photographs taken from space have a higher resolution and differences in colour (like this one showing Berlin's still-divided street lighting), having imagery at the mentioned resolution for the whole globe was unprecedented. Using combined data from many satellite pictures taken in April and October 2012, NASA published a beautified map in which the night lights were shown in yellow on a blue-ified version of the day-time Blue Marble picture. It shows even faint lights rather brightly and is thus well suited to spot even villages. 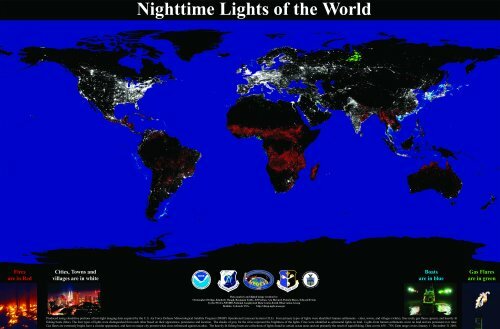 Recently, the Earth Observation Group at NGDC, which also provided the data underlying the above-mentioned NASA picture, has published grey-scale maps of night lights. Compared with the 2012 image, there are also a few blurred areas, probably due to cloud cover during the periods the data was captured. Most importantly, though, the map linked below better shows differences in brightness within big cities (e.g. industrial vs. residential areas), at the cost of making villages' dim lights hardly visible. Click to browse the 1992/2002 imagery in Blue Marble Navigator. The data can be downloaded here, but the files are about 300 MB each despite compression this is because they contain other versions of the pictures that are not limited to permanent lights, but also include forest fires etc. Please note that, as can be seen in the 'raw' images, NGDC only provided data between 65°N and 65°S, the (very few) lights near the poles have thus been extracted from this earlier publication. The blue background is an abridged version of NASA's 4-gigapixel Blue Marble picture. Higher resolutions of the above pictures as well as Blue Marble can be browsed here on blue-marble.de, but also requested by e-mail. 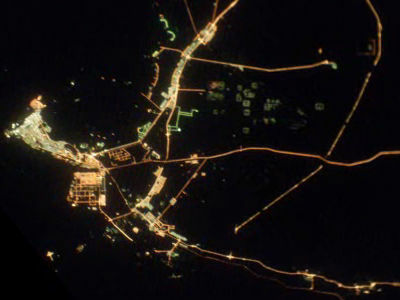 Cities or gas flares that had been registered at the brightness scale's maximum, anyway, naturally show no change and thus appear black on the high-res version. A similar picture for India, using three colours to also compare brighness levels for 1992, 1998 and 2003, is available here from NGDC. Original images and initial processing, unless otherwise stated, by the NOAA's National Geophysical Data Center. DMSP data collected by the US Air Force Weather Agency. Background picture by NASA's Earth Observatory.